Outgoing Crystal Palace caretaker boss Keith Millen is upbeat about the club's survival chances following the appointment of Tony Pulis on Saturday. Pulis watched on from the stands as his new team beat Hull 1-0 to record just their second win of the season. "What I thought was needed was someone with experience at this level because we haven't got a lot of that," he said. "If he can come in and add some experience then we have as good a chance as five or six teams." He added: "I said to Tony that I honestly believe these lads can stay up. You pick up on the vibes in training and there is a belief there. They feel they have a chance. "For me, Tony was top of the list and I'm delighted he's on board. I'm sure he'll be pleased to see the team here and see their commitment to the club. It gives them something to work with." Saturday's win moved the Eagles off the foot of the table and to within three points of safety. Millen revealed the former Stoke manager had not come in to the dressing room ahead of the game after a discussion between the pair. "I spoke to Tony this morning and we felt it was really important we stay focused on what we've worked on for the last two weeks for this game," he said. "If Tony had come in, it might have distracted from me being in charge and undermined me a little bit." 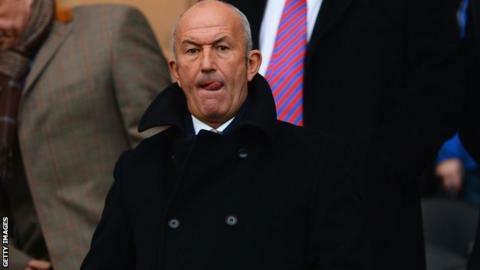 The ex-Bristol City boss admitted he was unsure if he would be kept on at the club under Pulis. He joined the Selhurst Park club with Ian Holloway last year and took four points from his four games in caretaker charge after Holloway's exit. "I'd love to stay here, hopefully I'll be in Tony Pulis's plans," added Millen. "I'm sure we'll sit down together and have a lot of discussions about a lot of things over the next few days." Palace travel to fellow strugglers Norwich City next Saturday for Pulis's first game in charge.